“BRITAIN set to swelter in 100F heat,” it said in the papers. But don’t we hear that every year? Truth is, the only way to be sure of summer sun is to leave these shores behind, preferably by ship. 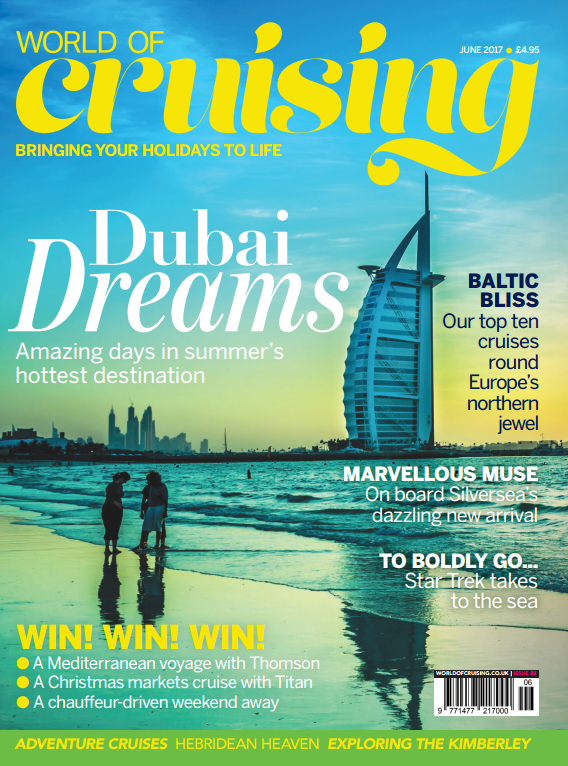 And if you’re yet to book your cruise, you’ll find this issue is packed with inspiring ideas – from brilliant bargains to six-star luxury, and from Dubai to Deep Space Nine (boldly go to page 44 to find out more). A little closer to home, river cruising is booming like never before, and the special supplement with this issue tells you everything about who goes where. I’m also thrilled to introduce our new River Queen, Jeannine Williamson, who’ll be answering all your river-related questions in her great new column, starting this month on page 67. However you choose to cruise, there are some great last-minute deals, and you can keep up with the very latest by signing up for our brilliant online newsletter – see worldofcruising.co.uk for details. Wherever you go and whatever you do, everyone at World of Cruising wishes you a truly fabulous holiday.